If you’re curious, this is a tiny 6 inch round single layer white almond sour cream cake. 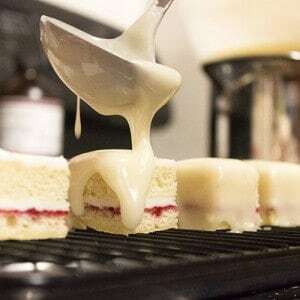 It’s covered with vanilla buttercream. After it crusted, I added the edible Easter grass and malted milk eggs. Easy-peasy, but oh so pretty! Anybody could make this one! Want more details about this cake? Go HERE! As simple as this cake is, it’s captivating to me. I can’t stop admiring it. 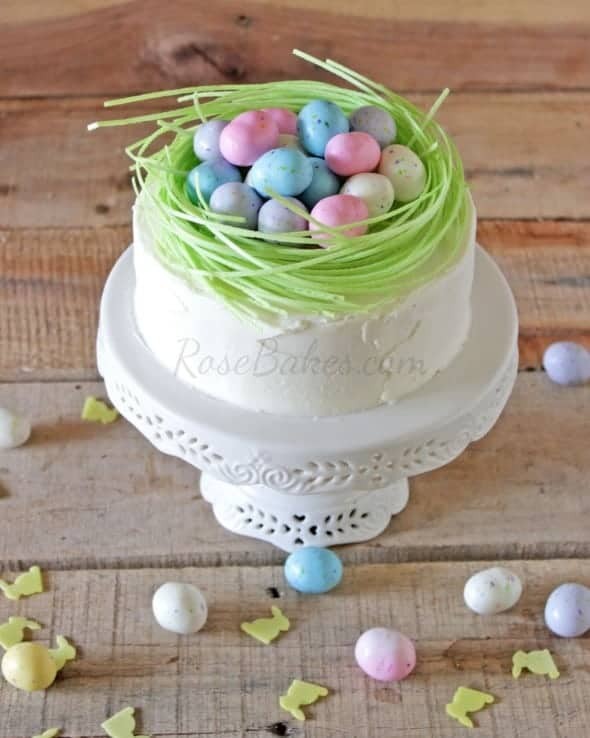 I love the rustic table in the background contrasting with the delicate and daintiness of the cake, eggs, and grass…wonderful photograph, Rose! Thank you Dara – Happy Easter to you too! Thanks so much Anna!! The edible grass is hard to find here – my husband accidentally found it for me this year – only one bag in the whole store! It can be ordered online, but it’s pretty expensive and it doesn’t taste like much of anything. However – I love it on the cake too – thank you!! Big hugs! ᑕᗩᑎ YOᑌ ᑌᔕE TᕼIᔕ ᑕᗩKE ᖇEᑕIᑭE ᖴOᖇ TᕼE ᗯIᒪTOᑎ EᗩᔕTEᖇ ᒪᗩᗰᗷ ᗰOᒪᗪ? ᗯOᑌᒪᗪ I ᑎEEᗪ TO ᑭᑌT ᗪOᗯEᒪ ᖇOᗪᔕ Iᑎ IT? TᕼᗩᑎK YOᑌ, ᒍᑌᔕT ᑕᗩᗰE ᗩᑕᖇOᔕᔕ YOᑌᖇ ᔕITE ᗩᑎᗪ I ᒪOᐯE TᕼE EᗩᔕTEᖇ ᑕᗩKE ᗯITᕼ TᕼE EᗪIᗷᒪE Gᖇᗩᔕᔕ. TᕼᗩᑎK YOᑌ ᖴOᖇ ᗩᒪᒪ TᕼE ᗪETᗩIᒪEᗪ TIᑭᔕ ᗩᑎᗪ TᖇIᑕKᔕ, TᕼEY ᗩᖇE ᐯEᖇY ᕼEᒪᑭᖴᑌᒪ! ᕼᗩᐯE ᗩ ᗯOᑎᗪEᖇᖴᑌᒪ EᗩᔕTEᖇ.